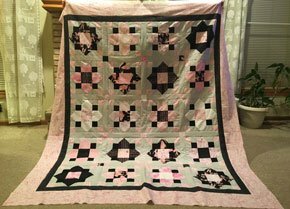 I'm one of those very fortunate grandmothers who has a grand-daughter who loves quilting. I knew when I first took her to a quilt shop at about the age of 4 that quilting would be special to her. She stood looking in awe at all the beautiful quilts. When I asked her if she would like to make one, she couldn't say "yes" fast enough. 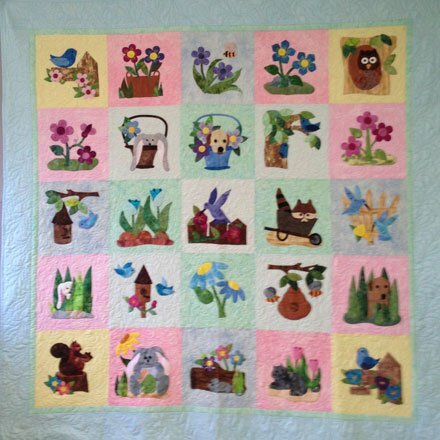 Her first little quilt was made up of just squares. But it was perfect for her. 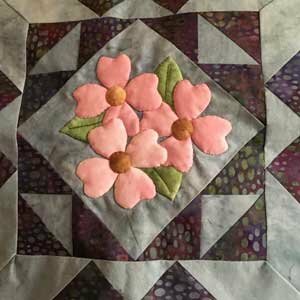 She began her quilt on Labor Day Weekend. 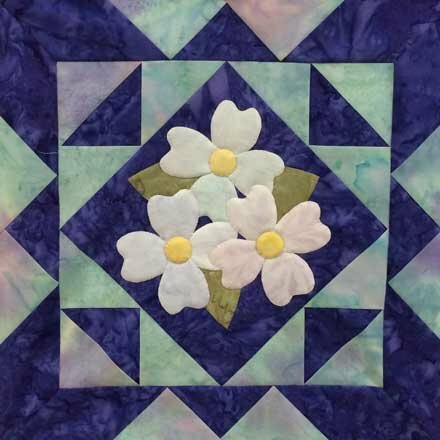 Quatrafoil is a Missouri Star Quilt Company quilt pattern. Jenny has a wonderful tutorial. That was all Livie needed. 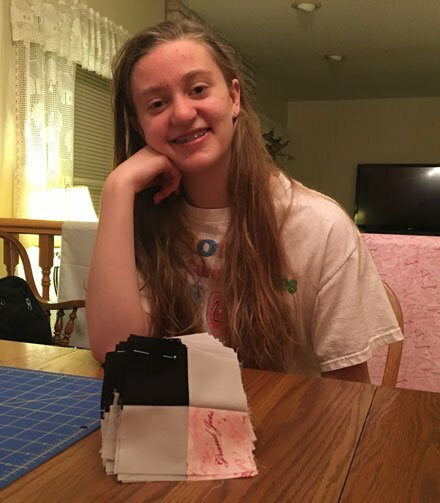 She watched the tutorial and proceeded to make her quilt. The Missouri Star tutorials are great no matter what your age. 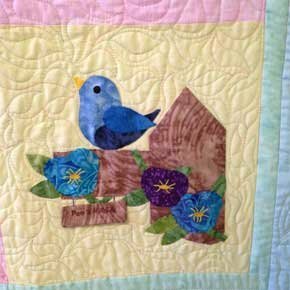 It is a great way to start your young person on the road to a lifetime of quilting. 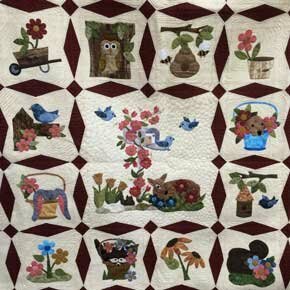 You will remember that last month I told you about our visit to the Little Traverse Bay Quilt Guild in Petoskey, MI. Jeannette Kling sent me the following e-mail. I just had to share it with you. We don't have any plans to travel next spring. I need knee replacement surgery but hope to be back on the road by fall. Who knows. We might just come to your area. We have had such positive reviews of your recent trunk show and class! 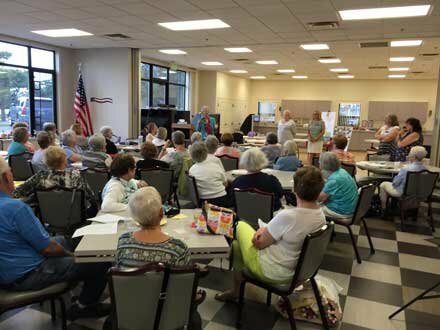 Everyone loved seeing your quilts and that just wants us to sew, sew, sew! Also, I am not sure I have seen class attendees so attentive at a tutorial. Think your format of sitting around you is fabulous. 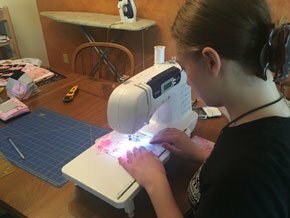 Also, not all teachers actively sew when explaining a technique. That was very helpful. 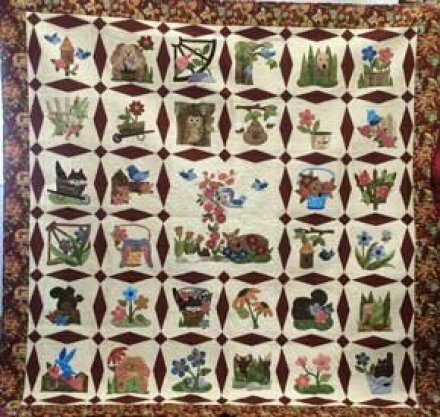 Karen Johnson's version of "Jennifer's Hillside"
One day, several years ago, when Karen Johnson still had the "Gingerbread House" quilt shop in Webster City, Karen asked me to help select fabrics with several quilters for my "Jennifer's Hillside" quilt. That day we selected fabric for 4 or 5 quilts. It was so much fun. In each case we selected a focal fabric then drew from the colors in that fabric for additional fabrics. Karen was the first to complete her quilt. it is very fall-ish. I absolutely love it. Great job, Karen! "It was quilted by David Beene. My family has a tradition that my nieces receive a quilt when they turn 50. My niece, Pam, turns 50 in September and in her honor I named it "Pam's Hillside". I think that is a great tradition. 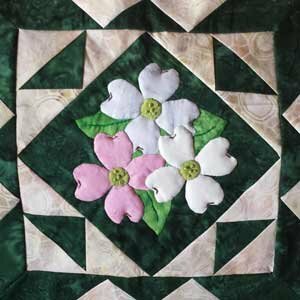 I have heard of traditions that give quilts when the recipient graduates from high school or college or gets married. Too often the recipients are too young to truly appreciate a quilt. 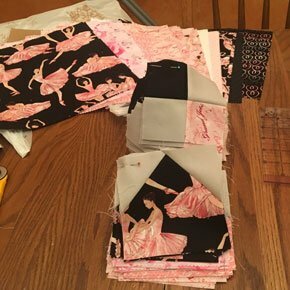 By the time they are 50 many of them will appreciate the work that goes into a quilt. The dogwood is such a simple flower, yet so elegant. If you are choosing realistic colors for your blocks, you will find that you are rather limited in color choices for this block. However, if you are letting your imagination soar, then these flowers can be any color you choose. This month Karen and Georgie have outdone themselves. Both blocks are gorgeous. Thank goodness I don't have to choose between them. I can enjoy them both. Karen's block is to the left; Georgie's block is to the right.